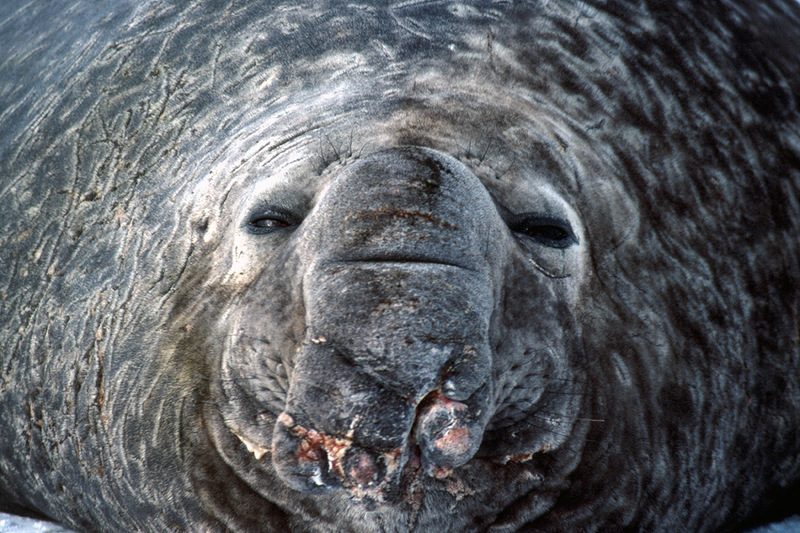 Elephant seals are the largest of all seals. Males can grow to 4.5m long (15ft) and weigh up to 4 tonnes (8 800lb). Like fur seals, they show a strong sexual dimorphism (difference in size between the males and females), females grow to about 2.8m (9ft) and 900kg (2000lb). A fully grown male and female side by side are commonly mistaken for an adult and juvenile. They are called elephant seals partly because of their size and also partly because of the males snout or trunk that he inflates to impress and intimidate rivals when competing with other males. This picture is of a male who has sustained damage to his trunk during a fight. This makes him less able to compete with rival males and so he was master of a very small harem of 2 or 3 females rather than up to a hundred that the biggest and strongest males can command.